* Rust-Oleum Dry Erase Paint (approx $20.00) I believe it says that it covers 49 sq ft of space. 1. Wash tables thoroughly. Remove all dirt and debris. Dry tables. 2. Optional - Tape edges of the table. If you do make sure you push down hard on the tape so the paint doesn't bleed onto the sides under the tape. I did three tables, two I taped and one I did not. I think I liked the untaped table better. 3. Paint the tables with the primer. This is optional because the dry erase paint will dry clear. You can leave the tables brown or whatever color it is, if you would like. I painted the tables with primer because I thought it gave the classroom a cleaner, brighter look. I used two coats even on a white faux marble table. Use the foam roller. Make sure you follow the directions on the paint can for drying. It is important that each coat of paint dries thoroughly. 4. Clean paint tray with warm water if you painted with the primer. 5. When you open the box of paint, you will find two cans inside. Mix part A (activator) and part B (base) separately, then pour A into B, mix it well. Poured the paint into the paint tray and begin rolling it on the tables. It will look textured, but once it dries it is smooth. You will need at least two coats of this paint as well. The video says 10 - 15 minutes of drying time between coats, but the back of the box says 20 - 30 minutes. I think longer is better. Humidity in the air may be a factor in drying time. The directions on the box of Rust-Oleum Dry Erase Paint also states that an open can should be used within an hour, or it will no longer work correctly, so keep an eye on the clock. 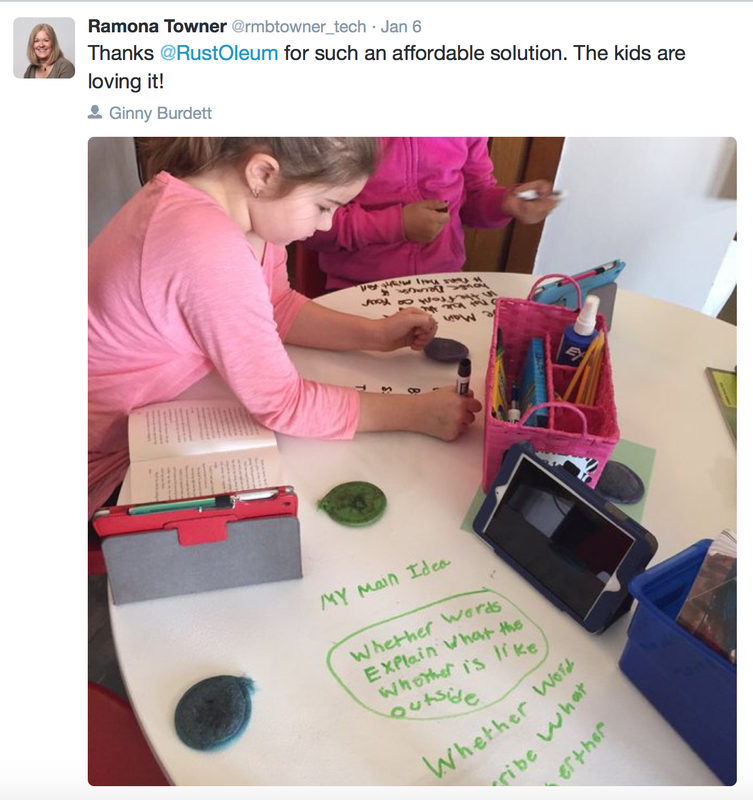 If you follow the directions you should get some, much needed, additional work space for your kiddos.